The solution to create a password reset disk to recovery account password in Windows 8.1, 8, Windows-10 and Windows Server 2012! The password reset disk feature requires removable media, such as a USB flash drive. Please insert a USB flash drive or other removable disk, to create a password reset disk! So, the best is to use a small USB memory stick! This is very good to be kept under wraps. Start Windows-Run (command prompt) [Windows + R] enter the command RunDll32.exe keymgr.dll,PRShowSaveWizardExW. (... see Image-1 Arrow-1)! Then just follow the instructions in the Windows 8.1 or 8 "Forgotten Password Wizard". 5 steps to the goal :-)! If already exists a Windows 8.1/8 password reset disk for this user account, creating a new one will make the old one unusable. If this disk already contains password reset information, this feature will replace the existing information! 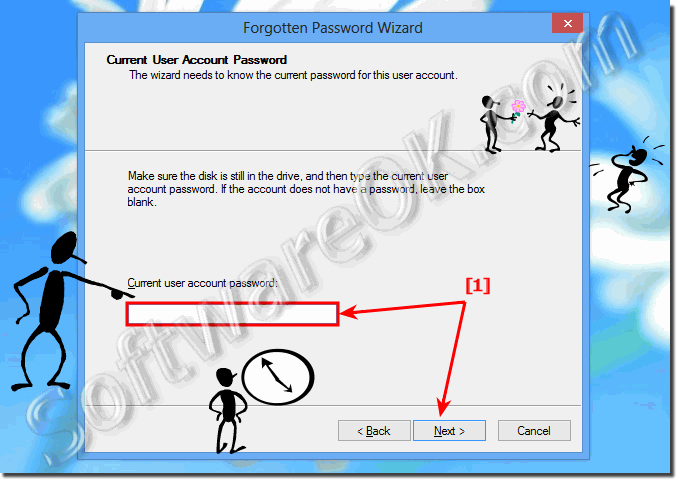 (Image-1) Start Forgotten Password Wizard in Windows 8.1, 8 and Server 2012! This wizard helps you to create a "password reset" disk. If you forget the password for this user account and you are unable to log on, you can use this disk to create a new password. (Image-2) Create a password reset eg. recovery disk for Windows 8.1 and 8! (Image-3) Enter current user account password for reset disk in Windows 8.1! Make sure the disk is still in the drive and then type the current user account password. If the account does not have a password, leave the box blank. (Image-4) Progress, create the reset disk in Windows 8.1! 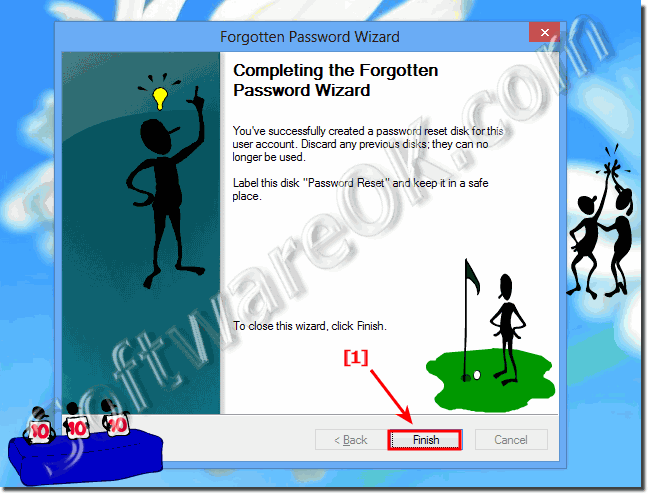 (Image-5) Completing the Windows Forgotten Password Wizard! You've successfully created a password reset disk for this user account. Discard any previous disks; they can no longer be used. Label this disk "Password Reset" and keep it in a safe place. Windows-8 - FAQ-139: Create a password reset eg. recovery disk for Windows 8.1, 8 and Windows 10! Create a Password Disk Windows 8.1? Windows 8.1 password reset software free download? How to create password reset disk for windows 8 server? How to create a password reset disk with command prompt in Windows 10? Password key disk for windows 8? Windows 8.1 password key disk? Make Windows 8.1 Recovery USB? How to make removable reset disk in Windows 10? UNABLE TO CREATE A PASSWORD RESET DISK IN WINDOWS 8.1? No disk this feature requires removable windows 8? This feature requires removable media? Windows 10 reset password this feature requires removable media? Cara mengatasi this feature requires removable media, such as a USB flash drive windows 8.1? This feature requires removable media windows 10? Eg for making anapchat password? This feature requires removable media such as a usb flash drive windows 10? How to set password in local disk in windows 8.1? Password reset disk windows 8.1? Create a Password Reset Disk in Windows 8.1and Windows 10? How to keep password for local disk windows 8? Windows 10 pw recovery disk? Software fore making a flash drive to a windows 8 and Windows 10 password recovery.? Create Windows 8.1 Recovery Disk? Freeware win 8.1 password reset disk or iso file? Password reset disk 8.1 and Windows 10? Password reset disc windows 8 and Windows 10? User reset password require removable media such a usb flash drive in Windows 10? Password reset disk for windows 8.1 and Windows 10? Create a backup password for windows 8.1? Forgotten Password Wizard Windows 8.1? Windows 8.1and Windows 10 Password Reset Disk? Password reset disk wizard windows 8.1and Windows 10? This feature requires removable media as a usb drive wondows8? How do you make recovery disks for windows server 2012? Enable administrator account windows 8.1 flash driver or cd for key disk in windows 8? Password reset disc for windows 8 and 8.1and Windows 10? Windows 8.1 using password reset disc? Password reset disk windows 8.1.?